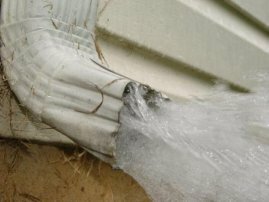 If you find that you do have downspout and gutter problems,don’t despair! There are several tasks that can resolve most of these problems with your home and garden, without having to involve a contractor. If you are the victim of gutters and downspouts that create drainage issues near your foundation look into these solutions. 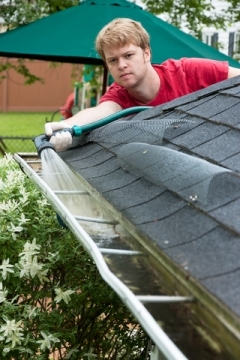 than draining through the downspout, you need to try first to clear out and unclog the gutters. Leaves, pine needles, and silt can clog gutters and keep water from moving freely through to the downspouts. Water runoff from gutters may also be caused by bent channels that allow water to run over the edge of the gutter rather than being funneled through the gutter channels to the downspout. Correct this situation by repairing the gutter in those locations. These gutter issues should be resolved! Unmaintained gutters can contribute greatly to those pools of standing water at the base of your foundation. Unresolved, water pooling at the foundations of your home can create longer term issues with your home and garden. If improved home maintenance tasks such as these do not resolve your downspout and drainage issues, then replace the gutters. Nothing you do to the soil around your foundation is likely to resolve this sort of landscape drainage issue. Gutter problems are not the only home maintenance issue that contributes to water drainage issues. Many older homes have not been maintained, and as a result, downspouts are not routing water away from the house efficiently. This is often due to the fact that the elbows at the bottom are missing or rusted through, and splash guards have not been installed. Fix these issues to route water away from your foundations. The soil around your home should slope away from your home by a ratio of 6 in. to 10 ft. at the very least. Soil surfaces that do not slope sufficiently near the foundation of your home can cause pooling at the foundation, and over time, can cause damage to the foundation or to basement rooms. By ensuring that the slope of your soil near all the foundations is adequate, you can reduce the impact of these drainage problems on your garden sites landscape drainage.